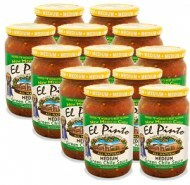 El Pinto's new Chipotle Salsa is adapted from our original recipe but with an added kick. El Pinto's new Chipotle Salsa is adapted from our original recipe but with an added kick. A new smoked jalapeno flavor that is great for dipping chips, putting on burgers and adding a fresh-roasted flavor to make any meal delicious. INGREDIENTS: TOMATOES (PEELED TOMATOES WITH JUICE, CALCIUM CHLORIDE, CITRIC ACID), ROASTED GREEN CHILE, SEA SALT, JALAPENO PEPPER, CHIPOTLE CHILI POWDER, GARLIC, NATURAL FLAVOR.